The debate over taxing high-income families to fund the expansion of health care coverage in America has renewed the broader question of government's role in redistributing income through tax and spending policies. What is missing from this debate is some hard numbers on how much current tax and spending policies redistribute income from some Americans to others and how much the policies advocated by the Obama Administration will change the overall amount of redistribution. The Tax Foundation's "Fiscal Incidence" project has filled this void by first calculating how much current tax and spending policies are redistributing, then estimating how much President Obama's policies—from taxes to health care to climate change—will alter that redistribution. Simply put, the Fiscal Incidence Model compares the total amount of federal taxes families pay (such as income taxes, excise taxes, payroll taxes, etc.) to the total amount of government spending they receive (such as entitlement benefits, defense spending, public works, etc.). 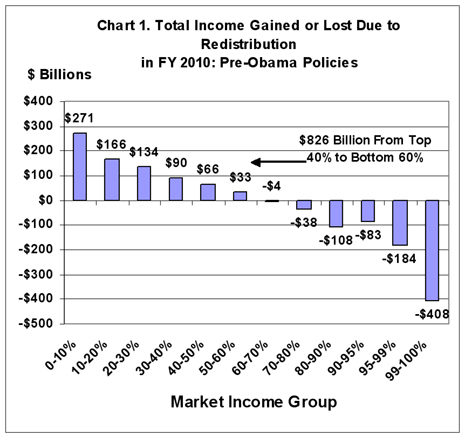 Chart 1 shows how much families in each income group gain or lose due to redistribution in FY 2010 before Obama's major policies on taxes, health care and climate change are enacted. Collectively, families in the bottom 60 percent of the income scale (those with market income below $86,000) will receive more back in government spending during the upcoming fiscal year than they pay in taxes. The top 40 percent of families will collectively pay more in taxes than they receive in spending. Overall, federal tax and spending policies will redistribute $826 billion from the top 40 percent of families to the bottom 60 percent. In other words, the majority of American families currently receive more in federal spending than they pay in taxes. More than 70 percent (or $592 billion) of the total amount redistributed is paid by the roughly 5 million families comprising the top 5 percent, those with market incomes above $280,000. At the other end of the income scale, more than half of redistributed benefits flow to the nearly 34 million families in the bottom two income groups—those with market incomes below roughly $23,500. Fully 80 percent of the redistributed benefits flows to families earning under $50,000, a total of 66 million families overall. With these benchmarks in mind, we can see how Obama's policies will affect each of these income groups and the overall amount of redistribution. When it comes to tax policy, President Obama has been very clear about his intention to shift more of the cost of government to the top 5 percent of Americans while cutting taxes on the bottom 95 percent. Similarly, the spending policies outlined in the Obama budget plan (such as new subsidies for education and health care) are intended to benefit not only low-income families but also the so-called middle class. Chart 2 looks first at the impact of these policies on the top 5 percent of families. In FY 2010, the relative amount of redistribution changes very little from current law, or "baseline" levels, because few of Obama's major policies will be in effect during FY 2010. The minor reduction in redistribution from the top 5 percent of families is largely due to a corporate tax provision that allows companies to carry-back losses for tax purposes. These lower corporate taxes tend to benefit upper-income families more because they receive more capital gains and dividend income. In 2012, baseline policies will increase the amount of redistribution from the top 5 percent to $649 billion, after adjusting for inflation—an increase of $57 billion or about 10 percent above today's level. This growth is mostly the natural result of the economic recovery which is assumed to increase individual and corporate income tax collections. 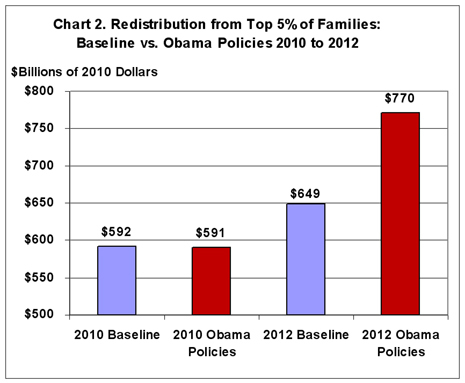 However, Obama's policies will increase the amount of redistribution in 2012 from the top 5 percent of families to $770 billion, after adjusting for inflation. In real terms, this is $122 billion above the baseline growth rate and $178 billion above current levels. Thus, when all of Obama's policies are in place in 2012, the total amount of redistribution from the top 5 percent of families will be 30 percent larger in real terms than the current level of redistribution. The next question is, Who benefits from this increase in redistribution from high-income families? The answer is, every other income group—including upper-middle class families. 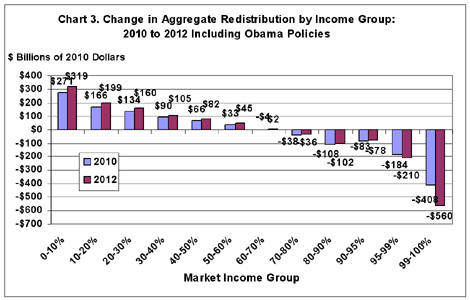 The aggregate changes in total redistribution between 2010 and 2012 are displayed in Chart 3 for each income group. A couple of pictures emerge. First, the chart clearly shows that families who are currently getting more back in government spending than they pay in taxes will see their net benefits grow substantially. 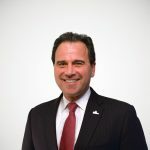 For example, families in the lowest income group will see their overall net benefits grow in real terms by $48 billion, or 18 percent, while families in the "middle" 50 to 60 percent will see their overall benefits grow by $12 billion, or 36 percent, after adjusting for inflation. Second, Obama's policies targeted to the "middle class" will actually make families in the 60 to 70 percent income group net "receivers" of spending whereas now they are contributors. In other words, a rapidly growing number of American families who earn above the median will be net recipients of government largesse. Under pre-Obama policies, this trend was already alarming: as a group the bottom 60 percent of families are receiving more from government than they pay in taxes. Obama's policies will increase the percentage of net "receivers" to the point that the bottom 70 percent of families will receive more than they pay in. That shrinks the group of "givers" to the top 30 percent of the income spectrum. Obama's policies will slightly reduce the amount of income redistributed from families between the 70th and 95th percentiles as a group, though they will remain "givers" on net. Overall, the total amount of redistribution from the top 30 percent of families will near $1 trillion. Missing from today's debates over various issues—ranging from the President's Budget to health care reform to climate change—is a basic understanding of how much federal tax and spending policies combine to redistribute income from some Americans to others. New analysis from the Tax Foundation's Fiscal Incidence project fills this void and puts hard numbers on the current amount of redistribution and how much the Obama administration's policies will affect that. Currently, the majority of American families receive more in government spending than they pay in taxes, with roughly $826 billion being redistributed from the top 40 percent of families to the bottom 60 percent. In 2012, after all of Obama's policies are in place, the amount redistributed from the top 5 percent of families will grow in real terms to $770 billion, a 34 percent increase over current levels. Every other income group will benefit from the increased amount taken from the top 5 percent of families and the group of families who, on average, get more back in spending than they pay in taxes will jump to 70 percent of all families. Redistribution is ultimately at the heart of all tax and spending debates in Washington. But lawmakers are doing the public a great disservice if they fail to talk in honest terms about who currently pays for government programs and services, who benefits, and how new policies will change that balance. For more information, go to Tax Foundation Special Report, No. 172.